This week students will be breaking down social media sites and building a comprehensive guide on our classroom wikispace. This project is designed to engage students by highlighting the positive and negative aspects of social media. Students will present positive ways in which social media can help them showcase their talents and connect with a vast audience. On the other hand, students will also present ways in which social media, if used inappropriately and irresponsibly can hurt their online identity. Students will be able to compare and contrast the differences between positive and negative uses of social media. 1. You may assign or have students choose the social media they want to analyze. I would suggest presenting each group with one social media platform to save time. 2. Once students are arranged in their groups, they must create a pro a con list for the social media they will be analyzing. Have each group open a Google Doc and share it with the teacher and all group members. 3. Once you have your wikispace up and running, have one member of each group create a link for their social media in navigation frame of the wikispace (left-hand side). A. Imagine that our school blocked your site. How would you present an argument to the administration to unblock this site? Why does the school need it? How will the students’ learning benefit from having this site open? NOTE: Keep in mind counter arguments to your points as you present. B. Interview one teacher and one administrator in the building. Ask him or her how they would use this site in the school and why we should have access to it throughout the building. NOTE: Please present a list of interview questions beyond the prompt I suggested in the previous sentence. Also, follow the MLA guidelines for citing an interview. C. Interview a guidance counselor and if you have the opportunity, a college representative. Ask them how students can use social media to increase their chances for college admission. Also, consider how students can hurt their admission chances if social media is used inappropriately. NOTE: Please present a list of interview questions beyond the prompt I suggested in the previous sentence. Also, follow the MLA guidelines for citing an interview. D. Interview two students and ask them how they use social media. Also, ask if they think their use of social media will help or hurt their digital identity. NOTE: Please present a list of interview questions beyond the prompt I suggested in the previous sentence. Also, follow the MLA guidelines for citing an interview. 5. I would like each group to set up a shared Google Doc folder that all members can access. In this folder you will house all of the files your group is using for this project. 6. One member of each group (or a different member each day) must compose a daily reflection blog chronicling the progress of the group’s progress. This project will take several days and in the end we will have a valuable resource made by students for students, teachers, parents, and administrators. This wikispace can become a sustainable document that future classes can learn from and add to as social media continues to evolve. In short, the class will be creating a digital textbook for digital citizenship in a high school classroom. If you decide to try this lesson with your class, please share a link to your wiki in the comment box below. Today’s lesson will introduce students to the term digital footprint. In the beginning of this lesson, simply write this term on the board. Have students come up to the board and write what they think the term means. Allow a few minutes for writing and then follow up with a discussion about what students wrote. · How would you describe your face-to-face identity (how people see you every day)? · How would you describe your virtual identity (how people view you online)? 2. Using yourself as an example, ask students how they perceive you as a teacher? Write down their responses on the board. 3. Google yourself and ask students to describe your digital identity. Watch the video below. 4. Continue the discussion by comparing the two identities. Do they match up? Are they vastly different? What are some of the differences between digital and face-to-face identities? Depending on time, these questions may be used to continue the discussion in class, or you could have students write a blog post comparing the two identities. Yesterday I introduced the concept of digital citizenship. I presented digital and social media in a positive light rather than explaining the negative elements that usually sensationalized and over dramatized by the news. However, every teacher should present the negative, dark side of social media and empower their students with lessons to prevent these abuses from happening. Today we will be doing just that. Depending on your class time from yesterday, your presentations on social and digital media tools may have leaked over into two class periods. If this is the case simply push back one day. Today's lesson will similarly model yesterday's lesson, but focus on the negative side of technology use. 3. Once each group has their tool, briefly explain what each tool is and its function. Most of the tools are common knowledge, but provide some background information in case students are unaware. How can my tool be used to distract or impede learning in my high school classes? How can my tool hurt my image and my talents to a college admissions board? How can my tool hurt my chances of landing a job? How can my tool hurt the reputation of one of my peers? Once you have presented these questions, allow students some time to work together researching the tool they have been given and developing their ideas. Depending on your class time you may wish to have them work on this project for more than one day or if you have the luxury of a block schedule, you can easily finish this task in one period. Again, this lesson is simply the antithesis of yesterday's lesson on positive impacts of social and digital media. You may chose a different method of presenting these contrasting ideas, but make sure you cover both sides of these new learning tools and platforms. Allow your students to see different perspectives on how these tools can be used to both empower and hurt themselves and their peers. 5. The final part of this project will be to have students present their tool to the class. They may use any method or form of presentation. As an exit slip or homework assignment, have students write a reflection blog on the tool they presented and one of the tools that was presented by another group. Today my class will begin strand 2.0, Digital Citizenship. Some may argue that this strand should be the first covered in the span of a school year, however, it is better to observe students behavior in cyberspace before giving them a list of things they cannot do. Plus, it provides a mutual trust with student and teacher. Today's lesson will begin by talking about the positive impacts of using digital and social media in high school. Again, before telling students all of the negative stories of digital and social media, put a positive spin on what you will be teaching for the next few weeks. It is easy to present social and digital media as negative entities, however, show your students that you believe in this powerful medium and that you trust they will use it in a responsible manner. How can my tool be used to enhance my high school classes? How can my tool be used to promote my talents to a college admissions board? How can my tool be used to find me a job? How can my tool be used to make positive change in my community, school club, or organization? Once you have presented these questions, allow students some time to work together researching the tool they have been given and developing their ideas. Depending on your class time you may wish to have them work on this project for more than one day or if you have the luxury of a block schedule, you can easily finish this task in one period. I sell a product to a market that doesn’t want it, but by law, is forced to buy it. This passage provoked the classes thinking and launched our weeklong project. The project has students redesigning one of their core classes and presenting their redesign in the form of a TED talk. They had to answer the following questions while working through this project, however they were not limited to these questions. a. What is the structure? How long is your class period? Yesterday I did not write a lesson because I wanted to combine it with today’s lesson. I had the privilege of skyping with a school in Van Meter, Iowa yesterday. I talked to Mrs. Shannon Miller’s Web 2.0/PLN class. I briefly talked about my experience with a PLN and how students should harness that power and use it to their advantage in a responsible manner. I explained that it is a great time to be a student despite all the negative publicity education receives. Students today have the ability to reach out and carve their own path like never before. I expressed how social media can help you land a job, promote your talents, and capture an audience. Mrs. Miller's students were excited to have this class and realized that their learning is going for beyond their classroom and far beyond Iowa. Then I thought about the project I was planning on writing for today. My students were presenting their TED talk classroom redesign projects, but why were they only presenting to the audience inside the walls? Why not use skype or iChat to connect with another school and truly flatten the classroom. And this is what I am suggesting. If you have been following along with these projects and having students present and use blogs as reflection tools, reach out to a member of your PLN and see if you can find a class to link up with. Connect the students’ blogs and reach out to the other teacher for ways in which you can facilitate, assess, and enhance the collaborative learning. Give your students an audience beyond their classroom walls. If you decide to do this lesson and are having trouble finding a class to link up with, please get in contact with me and I will help link you up with someone in my PLN. Today's lesson, students will continue working on their classroom redesign projects and TED talk presentations. At this point in the project (depending on your class time) students should start thinking about their presentation. If students are working in groups remind them that all members must present. They want to be confident and knowledgeable about what they are saying. It might be a good idea to revisit the TED talk presented by Dan Meyer or present another TED talk to give them ideas. What I will be doing for today's warmup is presenting this TED talk by David Eggers. Have students write a reflection blog post on this talk and ask them to focus on the process of innovation and seeing an idea through to completion and beyond. Remind students that this project is not just for a great but for an exchange of ideas. In the realm of school, students are the customer. We need to make sure their appetite for knowledge is satisfied. Also remind them that their TED talk videos will be presented at a faculty meeting and on the web. They should now have an understanding that their audience is not a letter grade, but real people who may choose to incorporate their idea into their own classroom. Yesterday, students started working on their classroom model redesign after watching the TED talk by Dan Meyer. Their objective is to take one of their current classes and redesign it. They will eventually present their new model to the class in the style of a TED talk. b. How is the content presented? c. How will students be assessed? e. How long is your class period? 2. Students may expand on the above questions, but remind them to focus on the questions above and what they envision one class day to look like. 3. Each group should create a shared Google Doc, Folder, and feedback form for this project. a. The Google Doc must be shared with all group members for collaboration and shared with the teacher. b. Students should create a shared folder via Google Docs. All group members and teacher should be invited. i. What did you like about our new classroom design? ii. What problems do you foresee with this design? 1. What suggestions can you offer for these problems? iii. Did the presentation effectively accomplish the intended task? Depending on your class time, this seems like a fair amount of tasks for students to complete today. For homework you can have them write a reflection blog on their groups’ progress. This can be structured as a journal entry or you can give them guiding questions. Today we will begin a weeklong project that will assess student’s ability to demonstrate what they have learned over the past three weeks. This unit will most likely be the shortest of the standard threads, but is crucial to setting a working infrastructure in the classroom. This project can be interpreted in a variety of ways. I will be using a TEDxTalk video by Dan Meyer, Math Class Needs a Makeover. Students will watch the entire video. Once the video is complete students will write a quick reaction post on their blog. This post is simply a quick free write of what they just watched. Give them roughly 10 minutes to write and publish this post. Explain that this quote will guide the following project. Students will have to sell one of their classes – English, History, Math, etc. – using this video as a format. They will have to enhance one of their classes by presenting a product that will sell to kids sitting in the classroom. In short, they will have to design, pitch, and sell a classroom model. Have students use the following guiding prompts to focus their classroom design. a. How will you apply the tools we covered over the past three weeks to your classroom design? You must include at least three tools. b. How will you change the way educators deliver content to students? Direct instruction? Independent practice? Project Based Learning? i. NOTE: It will probably be a good idea to explain what each delivery method is before setting them out on this task.c. How will you assess your students? Once you have explained all of the design components allow students to organize in groups of 2 and 3 (depending on your class size). At the end of the class today (again, depending on class time) students should have a rough design of what their classroom model will look like. The past three weeks have been a lot of setting up and introducing blended with independent practice. Students may become irritated, cranky, and anxious about using all of these tools on their own. And, hopefully they are starting to use them in other classes as well. Today we are going to send them on an search for information using the skills and tools we introduced this week: Diigo and Evernote. If you are presenting this lesson in a Web 2.0 class you will have many directions in which you can take this lesson. If you are integrating these tools and this lesson into a content area classroom, you will want to focus your lesson around what you want your students to find. 1. Have students respond to this prompt: Social Networks are closing us off from the rest of the world and creating a society of selfish, ego driven individuals. They are wasting time in workplace and are a constant disruption to a student's learning. 2. Explain that students would normally respond to this type of response in a written essay, however, that will not be the case today. Have students seek out information to either defend or challenge this prompt. Instruct students that they have the entire class period today to work in groups or individually and find clippings that support or challenge this prompt. NOTE: You may want to provide a list of sites that you suggest they use and explain that they must cite everything when clipping. Again, depending on what content area you teach in, you may want to cover web citations. I constantly think of this since I am an English Teacher. 3. Allow students to present in any way they want but require them to use one of the web clipping tools you just introduced. NOTE: You could have students write a blog reflection post on the positives and negatives of the web clipping tool they used to find, clip, and organize information. And that's it. Tell students that they will be presenting in class on Monday (unless you have a block period than you could do this in one day). You may wish to present a rubric for presentation guidelines. This lesson is a fun way of using some of the tools you have been covering for the past three weeks. Plus, they are covering a topic that they are surrounded by daily. This topic will also preview our next three units on collaborative learning, social networking, and digital citizenship. Today I will be beginning my two part series on Evernote. These two lessons will help you reduce paper usage in your classroom, library, and school building, while educating your students with great web tools for research and presentation. Like Diigo, Evernote allows you to clip sections of the web while you are browsing for information. Diigo will let you highlight and clip links, but Evernote allows you to clip a variety of web content including pictures. While the objective of both tools is to clip, organize, and filter personal web content, they remain different in their functionality. Evernote can be downloaded on to MAC and Windows operating systems and is completely free. This can also be used on smart phones and the iPhone. This lesson is simply an overview of using Evernote. You can access the videos below to show your students or faculty how to use this great web-clipping program. You may want to have students follow your lead while you are demonstrating Evernote on the projector or you can have them simply watch and take notes on what you are doing. Again, I find it best to model it first and then allow them to organize in groups and have some time to mess around with the program. For homework you could give them a subject individually that they have to research tonight online. Have each student find information pertaining to the topic you provide and the next day, have students present their findings. The past two weeks we have been setting up our classroom infrastructure. Today I want to allot some time for student reflection. I always feel my best observations and critiques come from my students. Not to say all my past Administrators have been poor on giving feedback, but I find my students understand the daily classroom dynamic better. Therefore, today's lesson will be a reflective piece for the students. Start the class by reflecting on all of the learning tools you have been incorporating for the past two weeks. Provide your own reflection verbally and explain briefly why we are integrating these types of tools. And then give them a few guiding questions to provoke their writing. 1. Technology simply slows down the learning process. Challenge or Defend this statement. 2. Why should we integrate technology when students have been learning without it for decades? 3. How does a networked classroom promote student learning? You may choose to select different questions, but for this assignment, I want them to take on the negative side of technology integration. I want students to put their energy into writing a post that defends what we are doing in the class with technology and get them to provide specific examples from the work we have been doing for the past two weeks. Why are we doing it? Is it all necessary? Get your students to drive home this point, however, accept the fact that you may have students challenge this notion as well. The purpose is not to get all students nodding their heads in agreement, but to provoke their thinking in the direction of forming an opinion and defending it. Depending on your class time you can have students write this blog post as an in class assignment and for homework have them comment on their peers' blogs. Make sure to remind them that grammar, spelling, and language structures count. Use the rubric I provided in Day 8. Yesterday I introduced Diigo. Today we will be exploring more features of Diigo beyond the basic setup and networking. There are many features Diigo offers for web browsing, collecting, and organizing. Today I will be covering highlighting tool, The Stickies tool, and how you can set up a group for your class or department. English – This is great for student research and gathering secondary sources. Students have the ability to highlight chunks of text within an article and make note of it with a sticky note as well. Students can also find information on authors you are reading and save them all under one tag. History – Like English, this is a great tool for research collections. If you are covering a specific period of history, students find news sources that connect of reflect that period. They can then add sticky notes and write their connections of the two time periods. Science – Students can conduct research on a specific scientific principle and find an example online of how that principle is being used in everyday life. They can highlight information and refer back to it as they scan the web. Math – Have students bookmark and highlight Dan Meyers blog. This is a must! Students can find a word problem that reflects a specific math equation and highlight an example of that in an article they find on the online. Or, students can collect data to create their own word problems by highlight information from a newspapers’ business section. Art – Students can find artist and then set out on a web quest to find and highlight information pertaining to that artist’s work and life. Again, most of the above examples fall under the category of web quest or research. You may want to start exploring Diigo by using one of the options above or you can invent your own. The videos below explain how students can bookmark, share, highlight, and create groups within Diigo for easy project collaboration. 2. Using the highlighting and sticky tools. The past two weeks my hypothetical technology class has been setting up their classroom infrastructure. At this point, they are connected in many ways: RSS, iGoogle, Blogs, etc. It is always a good idea to take the time to set up and make sure students understand these collaborative tools. Once they have these tools understood and in place, you can easily incorporate dynamic lessons and projects throughout the year. Plus, these “infrastructure” tools are applicable in any content area class. This week we are going to move in the direction of web organization and content sharing. In the next few days I will be presenting lessons on Diigo and Evernote. Both tools allow anyone to set up a free or premium account and share and organize web content. Today we are going to setup a Diigo account. It is best to show your students how to do this on the overhead projector with their laptop screens down. Model the basic setup and navigation of Diigo and explain various ways in which they can use this tool. There is also an instructional video on the main page at Diigo.com that will give students and teachers an overview of what Diigo is and what Diigo can do for you. I created two videos below to further illustrate the basic setup and navigation of Diigo. Tomorrow I will get into web highlighting, sticky notes, and groups. There are a number of ways in which Diigo can be incorporated into the classroom and faculty vocabulary. Yesterday we covered RSS feeds and had students set up their Google reader accounts. Today we are going to create RSS feeds within our classroom wikispace. This assignment will be a nightly assignment and will work in conjunction with their blog. Today, I want to focus on a reading strategy that I am using with my tenth grade English class. On my wikispace, I have several RSS feeds linked into a page. This page updates regularly and allows students to view the most current articles from The Philadelphia Inquirer, ESPN.com, NPR, etc. I tried to present an array of feeds rather than just one. The point of this assignment is to get students reading daily and to encourage reading independently. Also, students are acquiring knowledge about their world. Plus, reading and responding nightly is slowly building your students’ prior knowledge database that they can access on any…dare I say…standardized test. I find this to work best for high school students and especially AP students who will have to enter the English Language and Composition test with a well-rounded knowledge base. Every night students read one article from one of the five feeds I have selected. You may choose more than five or allow students to add to the feed. They must read the article, and then list three facts about the article, three questions they have about the article, one supported opinion and list and define any new vocabulary words they come across. They type this up in a Google Doc and then post it to their blog. NOTE: Always remind students to compose their blog posts in a separate forum so they can save frequently in the instance their blogger or word press page goes down. Students are always told what they have to read, this allows students the freedom of reading something they can select on their own and enjoy. Here is a video that will show you how to set up an RSS feed on your wikispace. Enjoy! Yesterday we incorporated RSS of student blogs into our iGoogle page. Students learned how to add an RSS feed for posts and comments to their iGoogle page so they could easily access their peers’ blogs. Today I expand on what an RSS feed is and how it can organize all of the content you read on the web. Also, we will cover setting up Google Reader for other classes and assignments. I have used RSS feeds in all of my English literature and AP English Language and Composition classes. I set up a RSS feed on our class wikispace that would update periodically with the latest news stories as they broke. Students would have to access this page nightly, read an article, and then either blog or journal about it. We also discussed the interesting stories of the week every Friday before class started. If a student did not have Internet access at home I would point them in the direction of the free library, a Starbucks (now offers free wi-fi along with most coffee shops, or have them simply find a newspaper. When students would complain about having to buy a newspaper I would usually ask them how much they spend a month on their cell phone bill. This would lead to me being right and the student in awe of how many newspapers he or she could purchase with each month’s cell phone bill. Again, this assignment had my students reading and writing each night. My AP students were constantly absorbing sources to use as references when they are writing their rhetorical analysis essays. These are skill sets that you can provoke and develop every night. In some cases, I had parents me asking about RSS feeds and thanking me for getting their son or daughter to read every night. Click here to see an example of this. 1. You may want to start by introducing your students to a brief history of what an RSS feed is, what RSS stands for, and how we can use them every day. Or you might want to show them the Common Craft video to get them started and understanding what a RSS feed is. 2. Once they have an understanding of what an RSS feed is, show them where they can find one. As part of their independent practice, have them select a popular news source and find an RSS feed on the page. Explain to them that RSS feed has a universal symbol. If you are using Safari there is a reader option embedded in the address bar. 4. Watch the video below and have your students follow along after you have modeled. For homework you might want your students to select 5 of their favorite news sources and add them to their Google Reader. Also, you can have them add the URLs from their class blogs. Today’s lesson may vary depending on what homework you assigned last night. If you assigned a blog post to your students you had the opportunity to check them over remotely. Today we will focus on the responsibility of writing and publishing online and how we can add RSS feeds to our iGoogle page. Today’s lesson should start be reviewing the blogging process that happened last night for homework. Have students recall any problems they encountered and how they felt when the hit the “publish post” button. NOTE: In the past, I have used my PLN or a small group of teachers online to read and comment on my students’ posts. This task will reinforce the presence of an audience and how important and powerful writing is when you are publishing to the world. As you present the responsibility of being an author online, you may want to incorporate a writing rubric for your blogging assignments. You can easily create your own of there are plenty of rubric online (see below). Tell students that this rubric will be used on every blog post and that students still need to proofread their work that is being published. Another good exercise might be to find blogs that you know are ill worded or grammatical incorrect and have students rate the blogs appeal with these errors. What does it do to the bloggers credibility? Would you read this blog again? The next phase of this lesson will be how students can access their blogs in different forums. 1. Have students return to their iGoogle page. (NOTE: You might want to do a random check in of all their iGoogle pages to see how they are using them after a week and a half of school). 2. Have them open up another tab and return to their blog home page they created yesterday. Once they have these two tabs open watch the video below. The video will show you how to add a RSS link to your iGoogle homepage. For homework, you might want to have your students subscribe to the classroom blogs or have them select one blog that they really enjoy reading that they can add to their iGoogle page. Last week we went over Google Apps and docs that will be staples in our class everyday. This week we will be setting up our classroom wikispace. The wikispace will incorporate many types of media and become our hub for resource sharing, hosting, and collaborative projects. Yesterday we set up our wikispace and went over the criteria for using and navigating a wikispace effectively. Today, students will be adding their blogger accounts to the wikispace. Students will be able to add an external link to a wikispace. The best way to begin this lesson is to model it for your students while their laptop screens are down and they are watching. You may want to place screen shots into a PowerPoint and show them the steps or you can simply walk them through the process. 1. The first step is to have students set up their own blog via blogger or you can choose to have one class blog. I prefer to have students create their own blog. Allowing students to create their own blog gives them ownership and gives them an online presence that they are responsible for keeping. 2. Once students have created their blogs have them grab the link, and copy it. 3. Return to the wikispace and explain that the left hand frame of a wikispace is like a table of contents. It will show you everything that is on the page and allow you to navigate through the entire site. Also explain that an external link will have a small green arrow after the link name. This will usually take you to another page or another tab depending on which browser you are using. 4. Show your students that when they click below on “edit navigation” at the bottom of the left hand frame, they will have the ability to edit the navigation frame. Remind them that even though the navigation text appears in the main frame, it will still only edit the left-hand navigation frame. NOTE: When I set this up before I edited the navigation frame the day before to display the title “BLOG ROLL” and underneath I typed in all of their names. This will save you time when setting up this feature on your wikispace. You can select this LINK that will allow you to see my AP English wikis setup. 5. 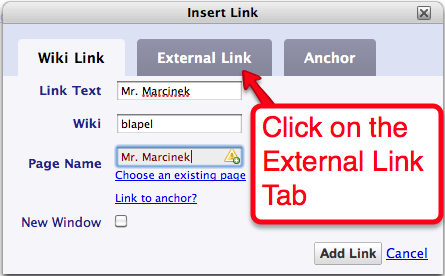 Have students click the “edit navigation” link at the bottom of the navigation frame. The text of the navigation frame will now appear in the main frame on the right. Have each student find his or her name under the blog roll, highlight his or her name, and click on the link button in the editing toolbar. 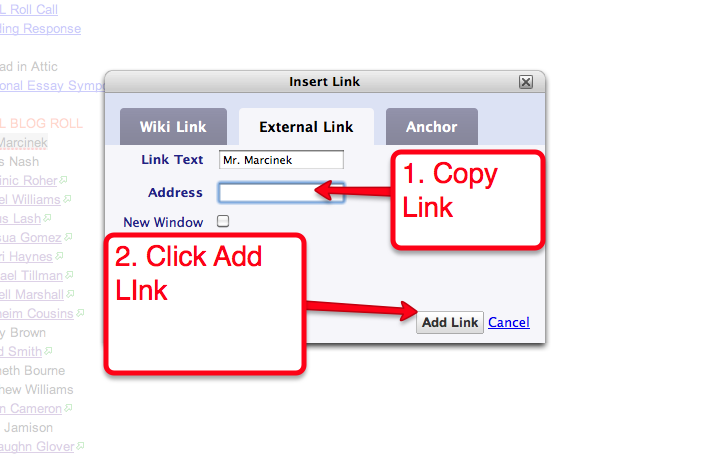 The “add link” window will pop up and allow you to add a link (see images below). After students select “add link” they will be taken back to the main page and their name will now be purple, have a line under it and a little green arrow will be following it. If they see all of these items, they have successfully created an external link to their blog. Make sure students click save, and the wikispace will be updated to reflect changes made. Today students created a blog that will be used for this class and added an external link to the wikispace. Having a blog roll of your students on your wikispace allows you, the teacher, and your students to learn and collaborate in an organized setting. Tomorrow we will cover blog writing procedures and expectations. For homework, you may want to give your students a writing prompt to blog about and have them post a comment on one of their peers blogs. This homework assignment will help segue into tomorrow’s lesson. Last week we worked with setting up our classroom infrastructure using an iGoogle Page and Google Docs, forms, and folders. This week we will be incorporating all of those skill sets into a website that we will use throughout the year. I am choosing to use a wikispace over Google Sits because I have always found wikispaces to be the most user-friendly site for the classroom, it allows for sustainability of resources and assignments, and allows students to take ownership of the site. Plus, until Google hires me full time, I can only pitch their product in moderation (call me!). Anytime I introduce a wikispace I like to show Lee LeFever’s CommonCraft video of “Wikis in Plain English”. CommonCraft videos have a simply, easy way of presenting tools in a very simple way. Plus, they are laced with subtle humor. 1. What is a wiki? 2. How can we use a wiki for class? 3. How will a wiki assist in our learning process? You may want to add more questions of your own, but make sure you generate a brief discussion around student responses and comments. There are many ways that you can begin teaching students about wikispaces, but in the beginning you want to keep it short and sweet. What usually do with students is give them a demonstration on our smart board of how to navigate the wikispace and how a wikispace can be manipulated. I also tell them that this site will be a collaborative forum. Their parents and administration will be viewing what goes on this page and it must be governed responsibly. I also take the time to go over Acceptable Use Policies and the tech rules that I drafted for my class. Here is my letter to parents explaining our classroom dynamic and inviting them to join the wikispace. Following the letter are rules we created as a class. Each student must agree to the rules of the classroom for technology use and the schools AUP in order to continue using technology. This trimester in English Literature and Composition, my class will be taking a new approach to learning. We will be utilizing various technology resources to communicate, collaborate, and differentiate instruction within our classroom. Each student will be setting up his or her own free e-mail account for my classroom. We are utilizing the G-Mail platform through Google Applications. This e-mail will only be used for our class. I told each student that they will have the opportunity to communicate with me through this e-mail and I ask you to do the same regarding any questions or suggestions you have for this venture. Secondly, I have created a classroom website that will only be used for my class. It is a completely separate platform from the school’s webpage, but serves many of the same functions. Our website is created through a wikispace. A wikispace is a site where we will communicate, collaborate and engage in a variety of classroom activities. The wikispace is a private platform and can only be accessed when the organizer invites you. I briefly showed the students how to use this site and informed them that they now will have 24-7 access to their classroom. If students miss class or are absent for some time, they can keep up with their work simply by accessing this site. All that is needed is a computer and an Internet connection. We have created classroom rules for this venture and on Wednesday, I had the students come up with their own rules for technology use in our classroom. They know these rules will be enforced and you can view our rules on the reverse of this page. Finally, one of my primary goals for this venture is to include everyone in the learning process. I invite you to join our wikispace and become a part of the learning process. If you have any questions please feel free to e-mail me or call me (e-mail and number to follow). If you would like to be a part of our wikispace learning community, please provide me with your primary e-mail address so I can send you an invitation to our page. Please provide your name, signature and e-mail at the bottom of this page. The Following Rules were designed by periods 1 and 2. No social network sites in school unless they are being used specifically for class. Second policy offense – cannot use laptop for the week and assignments will be done through another platform (i.e. pen and paper). Parents and Administration will be notified. Student will also have an after school detention. Today is our final day introducing Google Docs. The past two days we covered the basic skills that require effective, efficient use of Google Docs and forms. Today we will be setting up a shared folder within our Google Docs account. A shared folder allows you, and whomever you are collaborating with, to share files anywhere via one folder. Shared folders are private and can only be accessed by invitation. You can upload any time of file so this makes a great place for teachers and students alike to share files and collaborate. 1. Have students log into their Google Docs account. The video below will explain how you set up a shared folder with your students and how they can use a shared folder when working on a project in this class or any other classes where they have a collaborative project. This is a great way for students to keep track of files throughout the year especially if they are using multiple computer labs and carts. 2. The next phase of this assignment is really up to the teacher. You may choose to start a small collaborative project next week via Google Docs and shared folders or you can simply expand on how they can use shared folders in school. Since it is Friday, I will be presenting the following homework assignment to my students. 1. How will Google Apps assist in your learning process this school year? 2. Why should we use these tools in our classrooms? 3. What are some of the ways in which you will use the Google Apps taught this week in your other classes? Outside of class? 4. When you return on Monday you will present your findings to the class. Use a shared folder to house all of your documents you use for the presentation and collaborate remotely via Google Docs to work on this project. Yesterday we started working with Google Docs. In groups, students were given a specific task to learn, and present to their peers. 1. Create a new document, save it, and share it. 1. What problems did I encounter? 2. How did I solve this problem? 3. How can we apply my task to the class? To other classes? Today we are going to design, embed, and gather information using a Google form. Start this lesson by asking students a few questions about how they collect information. Students may respond with text message, email, facebook, mail, etc. And while those methods are all well and good, you have to do most of the organizing grunt work to bring all those different methods together. Explain that with Google Forms you can deploy one form that will gather all of your information and house it in one central location. Your data will be collected, transmitted, and saved for you. The only task required is that you set up the form. 1. Have students log into their Google Docs account. And before they select create form, set them up into groups of two (or more depending on your class size). 2. Using your smartboard or overhead projector, model on the screen how you set up a form. Show them the steps, options, and how to access the results after the form has been created. Show them themes and how to embed and email their form once it is created. 3. Once students have learned the rudimentary functions of a Google form, give each group a specific task in which they have to create a form. Give the students very general tasks like the ones listed above. Have students create a form that will gather information for each of the specific tasks above. You may choose to model one for them to get them started. Please see the video below for an example model. (Video to follow). 4. Once students have finished their tasks and set up their forms, have each group present their form to the class. Ask them to explain their reasoning for specific questions they added to the form and how they plan on using the data they collected from the form. Have the class respond constructively to the choices each group made with their form presentations. Does this form style work the best for what they are asking? Will this type of form yield results that we can work with? Etc. Once the presentations are finished you may want to do a brief reflection on what students learned about Google forms today and ask students to come up with other situations that they may use a Google form. Review the objectives and make sure all students understand and have mastered the form. You may want to give students an exit slip that has a problem or task on it as they leave the room. Explain that tonight they are to take that problem and create a Google form for their problem. You can review these at the beginning of class the next day and ask students to discuss any problems or setbacks they encountered with Google forms.